r : Shots - Health News The recommended change would mean that patients would begin treatment before they get extremely sick. In Africa, where millions of people are infected with HIV, a move to earlier treatment would be challenging for the public health system. The World Health Organization has issued revised guidelines saying that people with HIV should be put on antiviral drugs far earlier than was previously recommended. The hope is that most patients would get started on treatment before they begin to get extremely sick. It's a move that could have huge implications for African nations where millions of people are infected with HIV. In South Africa roughly 5.5 million people are living with HIV — more than any other country in the world. South Africa also has more people in treatment than anywhere else. 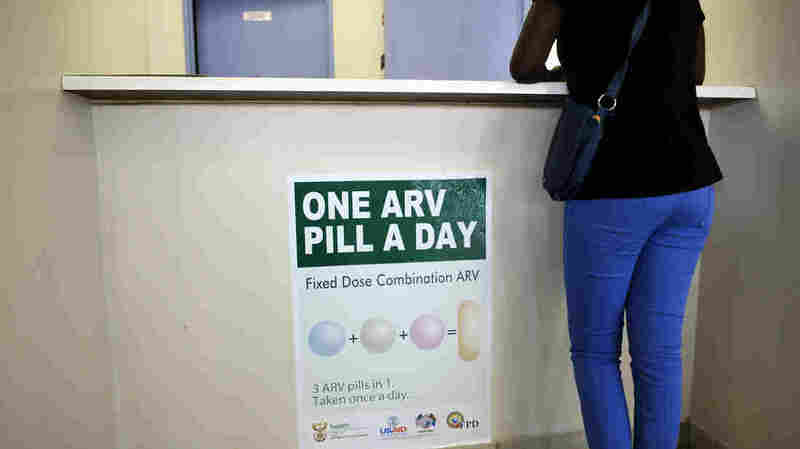 If the country ends up adopting the latest WHO recommendations, more than 1 million additional South Africans could be put on antiretroviral therapy at public expense. Joe Maila, spokesman for the national Ministry of Health, says adopting these WHO recommendations would have huge implications on an already strained public health system. "We need to see how many people are going to be rolled into the program," Maila says. "We want to see how much money that will cost us, because this [disease] is lifelong. Therefore we need to make decisions that are well-informed." The idea behind the new WHO guidelines is to treat HIV patients earlier in the course of the disease. The guidelines raise the threshold for treatment from a CD4 count of 350 to 500. The CD4 cells help activate the body's immune response. A higher CD4 count signifies a healthier immune system. The new treatment recommendations should mean that the patients won't get extremely sick and they'll be less likely to transmit the virus to others. Dr. Gilles van Cutsem, the medical coordinator for Doctors Without Borders in South Africa, says the new WHO guidelines are a major step forward in HIV treatment. The country already has just over 2 million people on antiretroviral therapy. Van Cutsem says adding an additional million to the rolls will be a challenge for South Africa. "That is a massive undertaking, and we see already that the South Africa public service is bursting at its seams," he says. Recently public health clinics in several parts of the country have completely run out of AIDS drugs. These outages sometimes last for only a few days, but some patients say they've gone on for weeks. The new WHO treatment guidelines are widely praised in the country by physicians and activists as a step forward. However, Dr. Francois Venter, with the University of Witwatersrand's Reproductive Health and HIV Institute, has been opposed to the new global guidelines. His chief concern is that older drugs, which are still used in Asia and other parts of Africa, can accumulate to toxic levels in the body. "If we start people on treatment earlier," he says, "particularly with the older drugs, it just means [patients] have more time to develop the toxicities. Where these old drugs are used, they shouldn't initiate [treatment] at this higher threshold." He's also concerned that the longer patients are on these drugs, the more likely they are to develop resistance to the medicines. And he's not convinced that the huge logistical and financial costs of starting treatment at a CD4 count of 500 instead of the current 350 outweigh the benefits. "Most of the transmission seems to occur below 350," he says. "Almost all of the illness occurs below 350. Treating above 350 — you're treating a very small problem." Sitting in an AIDS clinic at Johannesburg General Hospital, Venter says South Africa currently is struggling to consistently deliver AIDS drugs to the 2.1 million people enrolled in the system. He calls the drug shortages the greatest threat right now to South Africa's HIV program. "At a clinic just across the road from here, patients took some of the nurses briefly hostage because they were so angry that they weren't getting their treatment," Venter says. "They kept being told 'come back next week,' a week at a time, a week at a time. These are people with jobs. You spend the whole day, and significant cost to get to the clinic, and then being told, 'No, come back next week' — I think these people were just fed up and just lost it a bit." The Ministry of Health's Malia says the drug "stock outs," as they call them in South Africa, are a limited problem. And he says poor management of the drug supply chain has been to blame rather than the country actually running out of these medicines. Maila says there's no set timeline for deciding whether South Africa will move to put hundreds of thousands of additional HIV patients on drug therapy, but he says the ministry is seriously considering it.